Ariana Grande has had quite a year and now she’s receiving Billboard’s top honor: Woman of the Year. From her person life to her chart-topping songs, it’s no surprise that Ariana Grande has been at the top of everyone’s mind this year. Here’s everything you know and might not have know about Ariana Grande. The pop princess will be awarded Woman of the Year at Billboard’s Women in Music gala in New York on December 6th. The gala is in its 13th year and has honored music icons like Madonna, Taylor Swift and Lady Gaga to name a few. Ariana has had a year of ups and downs. The ups consisting of 3 number one spots on the Billboard 200 album chart, most recently for her album Sweetner that features songs like God is a Woman and Breathin. But let’s take it back 10 years to 2008, when Ariana began her career in the Broadway musical, 13. In 2009, Ariana was cast in the Nickelodeon show, Victorious, where she played Cat Valentine. While on the show, Ariana recorded herself singing covers of songs by Adele, Whitney Houston and Mariah Carey and uploaded them to YouTube. Ariana began working with vocal coach Eric Vetro, who has also coached Katy Petty, Pink, and Lea Michele to name a few. CEO of Republic records, Monte Lipman, saw the videos and signed Ariana to a recording contract. She released “Put Your Hearts Up”, but Ariana was not happy with it. She made it clear that she was not interested in recording that kind of music, and she did not go forward with the album. Meanwhile, Ariana started singing on Victorious, and even through the show was cancelled, her character was given a spinoff series in Sam and Cat. Despite her first unfinished album with Republic records, Ariana began working with Scooter Braun, who is credited with bringing Justin Beiber into superstardom. Ariana recorded her album Yours Truly with Republic records, where she leaned into her favorite genre, R&B. Her song, “Right There” featured Big Sean who she subsequently began dating. The album also featured Mac Miller on “The Way”, but we’ll come back to that in a minute. ‘Yours Truly’ eventually went platinum. Ariana and Big Sean dated for about 8 months and then parted ways, and Ariana began dating one of her dancers, Ricky Alvarez. The two caused an uproar after they were caught on camera licking donuts in a donut shop. Ricky and Ariana broke up after about a year of dating and here’s where mac miller re-enters the picture. In 2016, Ariana began dating Mac Miller, who was by her side through some turbulent times. On May 22, 2017, Ariana Grande was performing a concert in the Machester Arena in the United Kingdom. A suicide bomber targeted the arena and 23 people were killed. Ariana responded with a One Love Manchester Benefit concert, which raised more than $23 million to aid victims and their families. Ariana also visited her injured fans in the hospital. Understandably, Ariana speaks out in support of smarter gun control laws, and advocated for mental health awareness. She is also an advocate for LGBTQ+ rights, supporting her older half brother, Frankie who is openly gay. After releasing My Everything in 2014, Ariana then released Dangerous Woman in 2016. Meanwhile, Mac Miller struggled with sobriety and the two broken up in 2018. Ariana quickly began dating SNL cast member, Pete Davidson, and the two had a whirlwind romance culminating in an engagement and a breakup after just months of dating. During this time, Mac Miller passed away from an apparent drug overdose. Ariana released a song titled “Thank u , Next”, which directly addresses her past relationships and declares she is taking time to focus on herself. 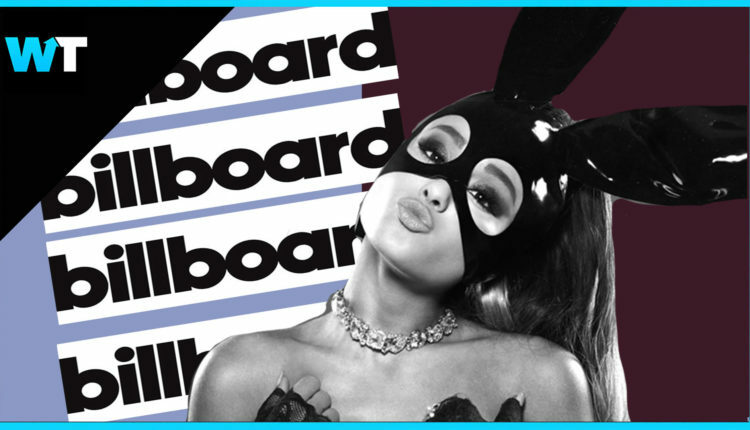 What do you think about Ariana’s latest accolade? Let us know in the comments or on Twitter at @WhatsTrending.